While you can start using digiKam without tweaking its settings, you might want to spend a few minutes modifying the application’s default configuration to make it work your way. digiKam features dozens of settings, and which ones you want to adjust is up to you. Here are a few examples to get you started. First off, choose Settings | Configure digiKam to open the Configure window which provides access to all digiKam’s settings. 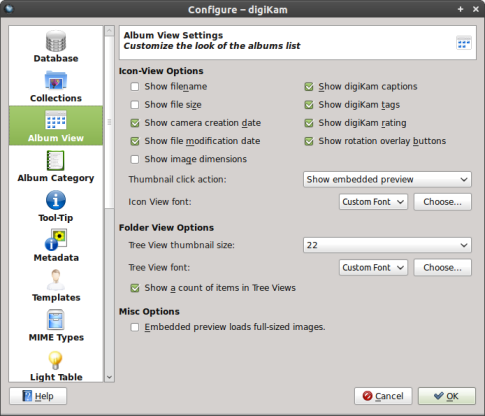 By default, digiKam uses the system font for the Icons and Tree views, but you can easily change that. Switch to the Album View section, select Custom Font from the Icon View font drop-down list, press the Choose button, and select the font you want. In a similar manner, you can change the Tree View font. While you are at it, you might want to tick the Show a count of items in Tree Views check box. When this option is enabled, digiKam displays the total item count next to each album in the My Albums pane. 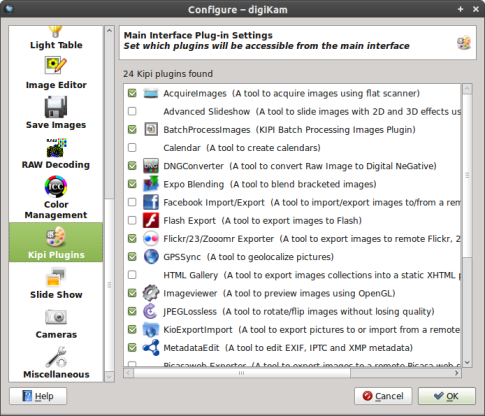 Some features in digiKam are available via so-called Kipi plugins, including most of the import and export features as well as some printing and editing capabilities. If you don’t use some of these features, you can easily disable them. For example, if you use the Flickr service to publish and share your photos, you might want to disable the SmugMug and Picasa export functionality. To do this, switch to the Kipi Plugins section and disable the plugins you don’t need. If you use a third-party tool like Rapid Photo Downloader to transfer photos from a camera to a folder defined as a digiKam collection, you’ll notice that each time you download photos, it takes a long time for digiKam to start. This happens because digiKam scans its collections and processes the newly added photos. To prevent this from happening and reduce digiKam’s startup time, switch to the Miscellaneous section and disable the Scan for new items at startup option. By default, digiKam automatically adjusts brightness when you open a RAW file. If you prefer to do this manually, you can disable this feature by switching to the RAW Encoding section and unticking the Auto Brightness check box. This way, you have full control over the brightness settings. digiKam sports extensive support for keyboard shortcuts, so you can perform common actions without using the mouse. Better yet, you can specify custom key combinations for actions that don’t have keyboard shortcuts. Choose Settings | Configure Shortcuts to open the Configure Shortcuts dialog window which lists all actions and their keyboard shortcuts. To assign a keyboard shortcut to a command, select it in the list, enable the Custom option and press the desired key combination. Finally, if you often use digiKam’s Image | Geolocation | Edit Coordinates command to geotag your photos, you might want to bookmark frequently used locations to speed up the geotagging process. To do this, find the desired location on the map, press the Bookmarks button, select the Add Bookmark command, give your bookmark a descriptive name, and press OK. This entry was posted in Open Source, Productivity on November 10, 2010 by wlmanager. Congratulations for hold in life a digikam! Which is version recommend for running digikam? I am newb in linux. I like digiKam very much. I have my picture files in many folders, and I would always prefer the keyboard to the mouse. 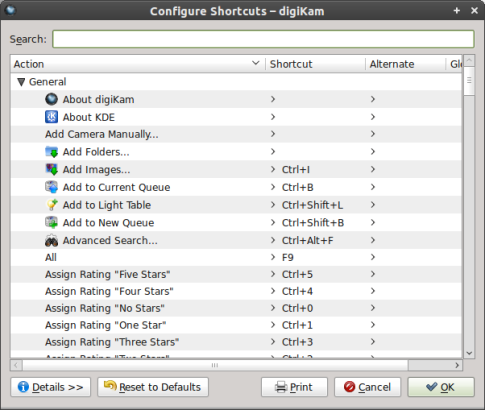 digiKam to use a keyboard shortcut to go to the next folder? Digikam worked for a while, but suddenly, all of the editor functions disappeared a week or two ago. Now the album shows nothing. The “Tips” function is all that works. No changes have been made to my Mint, Linux, operating system. Any ideas? Where are the digiKam files located in a Linux system? Is there any way to make digikam to download all the pictures and avoid the time-consuming task of exif rotation ? Or at least, leave that task to be done after the camera has been unplugged ? Might I simply say such a alleviation to discover someone who definitely knows what they may be talking about on the internet. You definitely can take a problem to light and allow it to necessary. Even more people should read this and understand this particular side of the story. I cant believe you’re not very popular because you obviously have the gift.